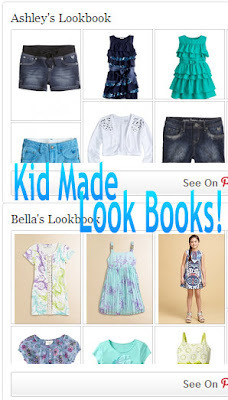 The Lachman Collection: Kid Made Look Books! I have been overjoyed the with the last few projects that I have made for my children. More so with their reaction to them, than the projects themselves! It's amazing how children start to form their own opinions when your not looking. One day they love anything you give them to wear, the next they only want to wear clothes that suit their style. I am determined to keep sewing clothes that they will love, and to help me do that I taught them how to pin. I give them very little direction on their own Look Books. The most I will say is "Summer is coming. Why don't you pin some shorts?" Of course, I keep an eye on them to make sure they aren't veering off onto inappropriate websites. My youngest daughter also needs a little help with navigation, but she is starting to get the hang of it. As my kids get older, they are less interested in talking with their mom about their favorite things (or anything else for that matter). I am so grateful to Pinterest for giving me one more avenue to keep that connection open, just a little bit longer. I subscribed to both boards! What a great idea! I want to see what the girls pin. My Bella is 8...how old are your girls? This is a great way to track their style!! My Bella is 6 (going to be 7 in a month) and she is my youngest. Ashley is 9 and my oldest is Matthew he is 10 and a half. What a great idea, I think I'd be a bit scared of what my seven year old would pin. We have somewhat differing style ideas!